The Animation Program provides students with a unique opportunity to experience a broad range of possibilities within the world of animation. From fine art to digital animation, this program encourages students to explore their potentials, and bring movement to their artwork through an intense and rigorous curriculum. CSSSA Animation students learn diverse experimental and traditional animation techniques under the guidance of leading artists in the field. They study the history and work of animators from all over the world, they participate in figure drawing classes, and they learn from professional animation artists. 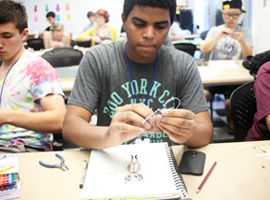 Animation students at the summer program are dedicated, hardworking, and open to new ideas. The Animation Department is very competitive; typically, only one-in-three applicants each year are invited to become Animation students. CSSSA Animators spend Mondays through Saturdays in workshops and classes on animation, storyboarding, life drawing, digital animation, and other related subjects. They also attend screenings of animated films (historical, contemporary, international and experimental), and additional workshops on subjects such as stop-motion. Students complete several projects during the program, involving traditional, cutout and digital animation techniques. Over the course of the session, each student produces five animated projects. At the end of the program, they have acquired an extensive toolbox for expressing themselves through the art of animation. Visitors to the program over the years have included French Animator Rene Laloux; Sally Cruikshank, an internationally renowned independent animator whose work includes several shorts for Sesame Street; the late puppet animator Helen Hill, Steve Hillenberg, creator of Sponge Bob for Nickelodeon; award winning stop-motion animator PES, Balbina Bruszewska, the Polish Princess of Animation; Conrad Vernon, the director of Shrek 2; the late Joe Ranft, storyboard artist for The Nightmare Before Christmas and Toy Story II; Alex Hirsch, creator of Disney’s Gravity Falls; and Pendleton Ward, creator of Cartoon Network’s Adventure Time. Both Alex Hirsch and Pendleton Ward are CSSSA Animation Dept. Alumni. Bobby Podesta, Stephen Gregory, Mark Walsh, and Sanjay Patel are also accomplished artists who started their careers in animation as high school students in the California State Summer School for the Arts Animation Program. These artists ended up becoming top animators for Pixar and have also been regular Visiting Artists at CSSSA. Their collective work includes Toy Story, Toy Story II and Toy Story III, A Bug's Life, Monsters, Inc., Finding Nemo, Cars, and Ratatouille. The department takes at least one field trip each year. This outing emphasizes observation and drawing from life; and often also concentrates on exposing the students to local museums and/or animation studios. Past drawing field trips have included the Los Angeles Zoo, Venice Beach, La Brea Tarp Pits, Olvera Street, Hollywood Forever Cemetery and the Museum of Jurassic Technology . 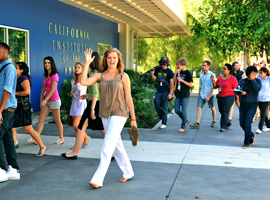 The students have also visited the Los Angeles County Museum of Art and animation studios such as Nickelodeon, Chiodo Bros., New Deal and Titmouse Studios. Kati Angelov is an international animator/educator who is currently a full time Associate Professor at the Media Arts Design department at Cypress College. She has been teaching over 15 years in different animation schools and is passionate about education. She holds an MFA in Animation and Digital Arts from the School of Cinematic Arts at USC. 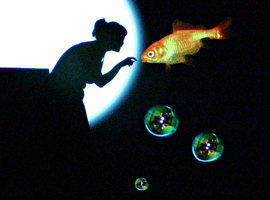 Kati’s particular area of interest is Motion Design and emerging technologies such as Projection Mapping. Her professional experience is in Motion Design, 2D Animation, Character Design and Illustration. Her employment history includes The Annenberg School of Communication, The Labyrinth Project, HUCK magazine UK, and the Walt Disney Company. Kati is an active member of ASIFA-Hollywood, Women in Animation and is the steering committee member of the ASIFA-Hollywood Animation Educators Forum, an international organization dedicated to the fine art of teaching animation. She has been a jury member for both international ASIFA college scholarship and faculty grant applications as well as for the 44th Annie Awards. Kati’s independent animated films have been shown internationally in festivals such as the Annecy International Animated film Festival and the World Festival of Animated Film-Zagreb, and were broadcasted on US Public Television. Triton is an artist, educator, and researcher in new media. His practice and doctoral research examines long term socio-economic and cultural implications of big data on marginalized communities both domestic and abroad. Triton’s interventionist and guerrilla campaigns have been exhibited at Art Basel Miami, Art Miami, and staged in Boston, New York, Providence, and Japan. to redesign and implement RISD’s Summer Graphic Design Program from 2011 to 2017. Triton received his MFA in Digital+Media from the Rhode Island School of Design. He is currently an Annenberg Fellow at USC pursuing a PhD in Media Arts + Practice. Triton’s latest project is the SafeSpaces Campaign, A socially responsive design platform that reimagines the functionality of public infrastructures through community based collaboration to address gun violence. Layal grew up on the shores of the red sea, drenched in the red-hot sun of the Arabian Peninsula. She was a little dreamer building worlds and sipping pretend tea while sneaking treats from her grandma’s bakery. Her love for color, magic and wonder brought her to where she is today.